A new month brings a new tangle in the spotlight over at I Am the Diva. This time the tangle is Yuma by Tina. I like this tangle but my version needs more practice. When using this tangle in the past, I have started out not liking the results but by the end, I like it a lot. For the tile I tried the original version of the tangle. I also tried my hand at Onion Skins, another new tangle I haven't tried. I enjoyed it but it also needs a little work on my end. I started to "shade" with a white charcoal pencil but changed my mind and just stopped. To fill in, I used a small brush as the pen wasn't cooperating. So, this tile, not my best but I learned doing it. I have used Yuma once before a few weeks back. I gave it a try when making a pin and experimenting with a new Shrinky Dink film. I used a black and pink sharpie to draw and used a Sakura gold marker to fill in the seed shapes. I felt a little lost as I was going but by the end I liked how it came out. Happy belated Thanksgiving to those who celebrated in Canada. I am looking forward to Thanksgiving here in the US. My family will be here to visit and I am excited to see them. I hope you all have a great week and thanks for stopping by! I love the icy look of your white on black tile. Beautiful. I think that white on black is stunning and I love the original Yuma, especially the gold centers. Such a beautiful way to showcase a tangle, in a pin like that! Well you may not think it's one of your best but it has a strangely vegetable/herbal/grassy feel to it and I like it a lot. Maybe the word I was looking for was organic. wow, the one with the goldseeds is amazing. whenever i showed this pattern to somebody, they got to the point that they did not like how it looks on their tile. but latest after shading, they where surprised about what they have done. Thanks for this great pattern and your kind words. I look forward to using it more. That white on black is so dramatic. Your pattern choices to complement the yuma are spot on, too. And the shrinky dink pin...hahahaha haven't heard of shrinky dink since the Girl Scouts. But it looks great. They both are very nice. Both are lovely! Especially I like the one on the black paper. Very harmonious choice of tangles! Maybe I have the beach on my mind, but it reminds me of beach grass from wetlands. Lovely. 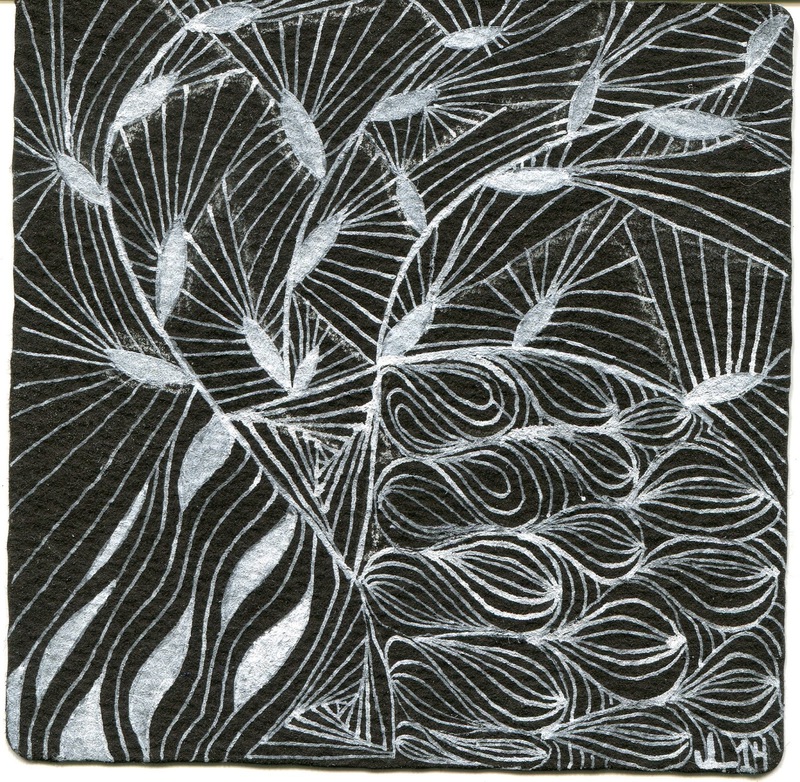 I love the black tile, your chosen tangles look great together. The shrinky dink pin is so much fun and I love the colors you used in that as well. Well done. I like both of your efforts. I love the pin.